Park City, UT – With the advent of multi-resort season passes like Epic and Ikon, a whole host of skiers have hit the road in 2018-19, embarking upon life-changing road trips across North America to visit ski resorts that have held a place on their bucket lists for many, many years. For those skiers who own an RV, or are willing to rent, this presents the perfect opportunity to load up and go with a motorhome or travel trailer. What they’ll find, however, is that there are precious few opportunities to camp near the slopes. A handful of ski resorts, including Oregon’s Mt. Bachelor and Snoqualmie in Washington State, allow slopeside overnight parking in one of their lots for true ski-in/ski-out accommodation. In most cases, however, skiers will find campgrounds near the resorts buried in snow and shuttered until spring. 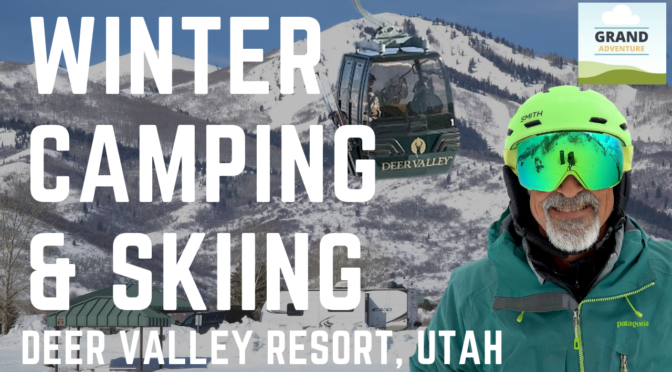 Skiers and snowboarders traveling in an RV have therefore been forced to be creative, finding unique opportunities to legally camp overnight near their favorite mountains. One such opportunity exists in Jordanelle State Park, right outside of Park City, Utah and adjacent to the base of Deer Valley Resort. Although the park’s campgrounds remain closed for the winter, park officials allow RV travelers to dry camp in their marina parking lot for $16 per night, just two and a half miles from the base of Deer Valley’s Jordanelle Gondola. What do you think? Would roadtripping in an RV be your perfect way to travel to ski resorts, or would you prefer a warm and cozy condo? Let us know in the comments section below!